Home BLOGGER Disclosure Policy Kaise Banaye Aur Disclosure Policy kaise Save karey Blogger(Blogspot) Blog mein? 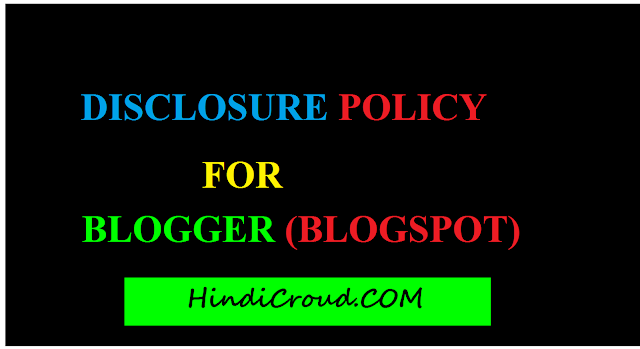 Disclosure Policy Kaise Banaye Aur Disclosure Policy kaise Save karey Blogger(Blogspot) Blog mein? Dosto aaj main apko bataunga disclosure policy ke baare mein,disclosure policy Google adsense Approval mein important Role Play karta hai,Disclosure Policy ek tarah ki apke blog ki entire information hai,disclosure policy ek tarah ki full information hai hamare blog ki,disclosure policy ko blog mein add karna bahut jarruri hai. Disclosure policy ko kaise Create karte hai?,vo sabhi steps niche diye hue hai,Inki help se aap easily disclosure policy Bana sakte hai. Step 1:-disclosure policy Generate karne ke liye sabse pahle apko disclosurepolicy.org par jaana hoga. Step 2:-Ab apko "Generate Policy" par click karna hoga. Step 3:-Ab apko 6 step se gujarna padega First step mein hai hai 3 Options ,Jish blog ke liye aap disclosure policy generate kar rahe ho agar vo apke dvara hi likha hua hai to option 1 par click kare aur continue par click karey. Step 5:-Ye jo step hai vo hai "Advertising & content" agar aap apne blog se koi Compensation nahi chahte ho to 1 option par click karke "Continue" par click karey. Step 7:-yeh step hai "Conflicts of interest" ishme Aap first option ke circle par click karey aur "Finish" par click karey. Step 8:-Ab aapke blog ki disclosure policy generate ho gayi hai Isko copy kar le . Disclosure policy kaise banaye blog ke liye? Dosto Ab main apko batata hu ki Blogger(Blogspot) Blog Mein Disclosure Policy Kaise Submit karte hai?,Niche kuch steps diye hai jinki help se aap blogspot blog mein Disclosure Policy Save kar sakte hai. Step 1:-Sabse pahle aap www.blogger.com par click karey. Step 2:-Ab Gmail "Email Id" aur "Password" fill karke "Sign In" par click karey. Step 4:-Ab "Pages" Par Click karey. Step 5:-Ab "New page" par click karey. Step 6:-Ab apni "Disclosure Policy" ko Isme Paste kijiye aur "Title" mein Disclosure Policy Likhe. Step 7:-Ab "Publish" par click karey. *Disclaimer Kaise Banaye Aur Kaise Add karey Blogger(Blogspot) mein?